If you want a ground beef with a very good flavor and that it arrives fresh to the door of your house – the “Omaha Ground Beef" is the one. If you don’t find tomatillos where you live, you can go for the option of canned tomatillos with “La Costena Tomaillos". Unfortunately, the flavor is not the same as that of the fresh tomatillos but they will do a good job in your enchiladas. The enchiladas are a typical Mexican dish that consists of various corn tortillas bathed in salsa and filled with a stew . When the enchiladas are served, on top is put a kind of salad that admits many variations. 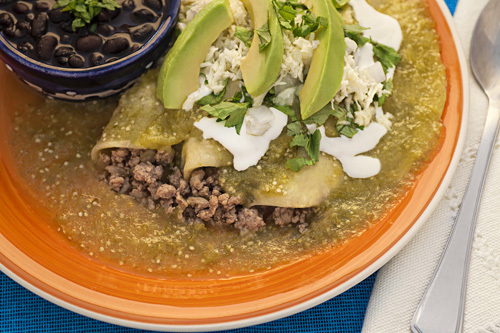 In this Mexican recipe the enchiladas are filled with a ground beef stew, the tortillas are covered with a type of green salsa and at the end the enchiladas are garnished with Mexican cream, cheese, avocado, onion and coriander. – The best part about the enchiladas is that while you eat them, the salsa that covers the enchiladas enters to bath the beef with its tasty flavor. It is a sensation that will delight you . In Mexico the enchiladas are served as main course and they can be accompanied with red rice , white rice , refried beans , mixed salad or with your favorite appetizer. To make the enchiladas you have to work in many stages, it is a bit complicated but you will have fun with the recipe and surely you will repeat it varying the filling and the salsa. Prepare the tortillas that are used in this recipe and give a unique flavor to your enchiladas. In this recipe is very important to use a vegetable oil to fry the tortillas because the olive oil is not good for frying dough. Make sure that the ground beef is fresh because it lasts a short time in the refrigerator. The preparation time of the enchiladas is of 30 minutes . The recipe serves 10 enchiladas. Leave the ingredients cooking in the boiling water for about 5 minutes, until the tomatillos turn to a lighter color. 1.1 lbs of Ground Beef. Mix the frying pan ingredients and fry them for about 8 minutes, until the beef is well cooked; stir regularly. Then set aside. Pour in another frying pan approximately 1 cup of vegetable oil, so you end up having about a 1/2’’ deep oil layer. All this procedure is made so the tortillas have more flavor. Cut 1 avocado into strips and also finely chop 1/4 of an onion (1.2 oz) and 2 coriander sprigs; then set aside. Put on a large plate the fried tortilla with salsa, put over the tortilla some of the ground beef that was cooked and roll it as taco or fold it as quesadilla; then set aside. Preferably put the ingredients in the same order as given so the enchiladas come out divine. Suggestion: After the enchiladas, close your meal with a tasty Mexican dessert. Variation: The enchiladas can also be filled with chicken or shredded beef. ➤ Mexican Food with Pasta.